Trained, passionate & highly experienced Spanish teachers! Spanish Teachers & Academic Department: meet our Academic Directors and some of our Spanish Teachers, the true souls of Habla Ya Spanish Schools. Customer Service Department: meet our Host Family Coordinators and our Extra Activities Coordinators. Language Travel Consultants: meet the friendly faces of those who help you plan your trip to Panama. Ex-Habla Ya: former staff that made the difference. If you're interested in being part of this exclusive team of professionals, please Contact Us. Besides Spanish teachers, we are also continually hiring people passionate about customer service, tourism, sales, marketing, human resources, SEO, social media, management in general and other areas. If you have what it takes to be part of the best of the best, what are you waiting for? Interests & Hobbies: Listening to music, dancing, eating, eating and eating! Spanish Learning Advice: don't wait, JUST DO IT! Our team of Directors lead the path by example everyday. Several of them are Spanish teachers as well so they perfectly know what it takes to be the best of the best. If you need literally anything, they'll be there for you. When choosing a Spanish school, teachers are the single most important element to consider. Well trained, experienced and passionate Spanish teachers make the difference between learning the language or not. Spanish Learning Advice: life is one... enjoy! Interests & Hobbies: The Eurovision Song Contest, Classic Films, Reading and 100% Instagram Addict! Favorite Food: Thai & Southern American Food! Spanish Learning Advice: Interact with local people makes the learning easier. Spanish Learning Advice: Have fun! Spanish Learning Advice: Habla, ya! Speak at any given moment that you receive the opportunity to practice. Traveling to a foreign country can be challenging... that is why our team of Language Travel Consultants are here to assist you 7 days a week to answer any questions you have, help you plan your trip and make sure you get here safe and sound. Irma Changmarín, an industrial engineer that discovered that teaching was her vocation. She had 5 years of experience teaching Spanish as a foreign language in Panama City when she went to Sevilla and took the renowned course for teaching Spanish as a foreign language at the famous institution CLIC IH Sevilla in Spain. After that we hired her. Irma trained several of our current teachers in the Communicative method for language teaching and together with the rest of our teachers she set the foundations to design and built our initial level system and course syllabus. 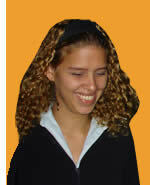 Lucía joined Habla Ya on a temporal contract during 3 months to do the training of our first teachers. Our first teachers had Spanish degrees from local universities but no previous experience in teaching Spanish to foreigners. Joined Habla Ya in 2005 during 3 months. Degree in philology in 2003 from Universidad de Costa Rica, San Pedro de Montes de Oca, San José. Previous experience at Costa Rican Language Academy, Forester Instituto Internacional and WAYRA Instituto de Español. Panamanian Spanish Schools are very recent in comparison to their counterpart in Costa Rica. In Costa Rica you can find more than 80 or 90 language schools throughout the country and several of them have been around for more than 30 or 40 years. 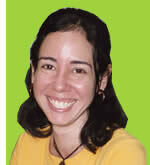 In Panama you'll not find schools with more than 20 years of experience in teaching Spanish. This is why we decided to import Lucía's experience from Costa Rica. Getting on board and retaining only the BEST Spanish teachers! Contact us! As Jim Collins says: good is the enemy of great. At Habla Ya Spanish Language School we have one priority above all others: to acquire and hold on to as many of the best teachers as we can. Why? Because they are the most important part of any Spanish language school. Our Spanish teachers care about what they are doing and believe in its purpose very deeply. They know that teaching is a vocation and more importantly they know that teaching is their vocation. This is why they work each day to be the best teachers they can be and this is why our school is full of great teachers. And this is why our school is the best Spanish language school in Panama. If you would like to join the best of the best, please Contact Us.